You know, I always say that every cigar has a story and if it doesn't I'll just make one up! Cigar bands are a huge thing for me. Someday I will devote an entire post explaining why this is. But briefly today, just due to the band design of the Reunión Digestivo Double Robusto I would grab a couple off the shelf to purchase. It's a great design that will stand out well on a shelf, plus it reminds me of the Minas Tirith flag in the Lord of the Rings movies, and I think that's pretty neat. 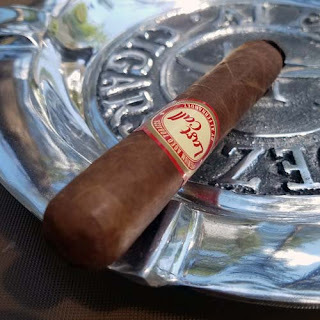 Besides that bit of fun, the Reunión Digestivo by Bodega Premium Blends is offered in three vitolas: double robusto – 5 x 54, corona gorda – 5.5 x 46, toro – 6 x 52 for this review I am smoking the double robusto so let's get on to the details. Construction of this Reunión Digestivo was near perfect. The oily, toothy, wrapper did show some seams, but they were all tight and it gave me a good view of how sturdy the wrapper was. Feeling down the body it was firmly packed with no noticeable hard or soft spots. Testing aromas from the foot, I found a pleasant mix of toast, rich tobacco and tree fruit. The same flavor mix was present once the end was clipped and the firm cold draw was tested. As I performed my normal pre-light toasting of the foot an oil line started to immediately develop on the wrapper. Once it was burning, the cigar produced a large volume of medium bodied smoke from both ends. Initially from the first inch the predominate flavors were cedar and earth. As the razor sharp burn progressed toward the 1/3 mark, flavors of cocoa, brown sugar and oak joined in. Near the center section there were nuances of caramel and a bit of mild red pepper. I did notice about then the smoke was leaving behind a sweet chocolaty aftertaste on my palate. Once the red pepper passed, there were notes of nuts, molasses, cream and cocoa that built into a nice long full bodied finish. Burn wise, the Reunión Digestivo was fantastic. The razor sharp burn line left behind a semi firm light gray that held on to the middle where I bumped it off and a nice oily sheen developed on the wrapper. Overall this Reunión Digestivo was a fantastic cigar. Would this cigar be good enough for the King of Gondor? Yes, I think it would. It had a great burn, great flavors including a long flavorful finish and it gave me 55 minutes of pure smoking pleasure. The $11.oo price tag is in what I call my super premium price range so I doubt if I will ever pull the trigger on a box purchase, but I would pick one up from time to time.